With the 2013 government shutdown and debt ceiling crisis now behind us, one conclusion seems inescapable — this was a disaster for the Republican Party. While both major parties received negative reviews from the American public for their performance in the crisis, it was the GOP that took by far the bigger hit to its image and standing in national polls. In the midst of the crisis, the Gallup Poll found that the percentage of Americans rating the Republican Party unfavorably was the highest ever recorded for either party since they began asking the party favorability question in 1992. The shutdown and debt limit impasse were almost exclusively the work of the Tea Party and its allies inside and outside of Congress. External groups like Heritage Action and FreedomWorks along with right-wing media commentators like Rush Limbaugh played key roles as cheerleaders for these confrontations. And members of Congress affiliated with the Tea Party, most prominently first-term Sen. Ted Cruz (R-TX), were the strongest supporters of the shutdown and debt ceiling conflicts and the most vocal opponents of the deal to end the crisis. In the aftermath of the crisis, there are signs of a growing divide within the GOP between establishment conservatives and the Tea Party. A number of prominent Republicans including Sen. John McCain (R-AZ) and some conservative business groups that are closely allied with the Republican Party, like the U.S. Chamber of Commerce, have been calling for a clean break between the GOP and the Tea Party. There has been talk of sponsoring challengers to Tea Party incumbents in some 2014 Republican congressional primaries, and some are even organizing SuperPACs to aid establishment candidates against Tea Party opponents. But how serious is this emerging divide and how likely is it that such challenges could succeed? Evidence from the 2012 American National Election Study (ANES) makes it very clear why the Tea Party poses a serious threat to the future viability of the Republican Party in national elections. But these data also show why any attempt by the GOP establishment to challenge the influence of the Tea Party will be very risky and could easily backfire. Among all respondents in the 2012 ANES survey, opponents of the Tea Party outnumbered supporters by 36% to 26%, and strong opponents outnumbered strong supporters by 26% to 12%. However, among Republicans, including independents who lean Republican, Tea Party supporters outnumbered Tea Party opponents by a 52% to 14% margin, and strong supporters outnumbered strong opponents by a 25% to 6% margin. These results, and similar results from other surveys, make clear that support for the Tea Party among the American public is almost entirely confined to Republican identifiers and independents who lean toward the GOP. Table 1: How representative is the Tea Party? Source: 2012 American National Election Study. Table 1 compares selected social characteristics and attitudes of Republican Tea Party supporters with those of other Republicans and the overall electorate in 2012. These data show very clearly why the Tea Party movement poses a major threat to the future viability of the Republican Party in national elections. 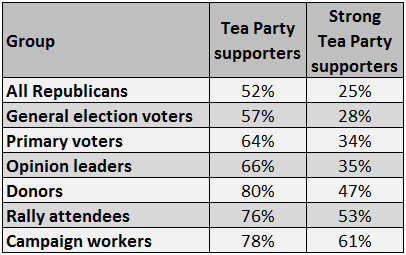 Contrary to the frequent claims made by Tea Party leaders that they represent a majority of Americans, the results in Table 1 show that Tea Party supporters stood out in many respects from other Republicans and were highly unrepresentative of the overall electorate. Compared with other Republicans and the overall electorate, Tea Party supporters were older, whiter, wealthier and more likely to be male. But by far the most dramatic differences between Tea Party supporters and the other groups involved their political and social attitudes. Tea Party supporters were far more conservative than other Republicans on a wide range of issues including social as well as economic issues. The differences between the social and political attitudes of Tea Party Republicans and those of the overall electorate were even more dramatic. These Tea Party supporters were much more conservative than the American public on social as well as economic issues, more religious and much, much more negative in their opinions of Barack Obama. It is their overwhelmingly negative opinions of the president that perhaps most distinguish Tea Party supporters from the overall American public. A stunning 91% of Tea Party supporters strongly disapproved of the President’s job performance, and the average rating that they gave to Obama on a feeling thermometer scale which has a range from zero degrees to 100 degrees was a frigid 16 degrees. About half of Tea Party supporters indicated that they believed, contrary to all evidence, that Obama was born outside of the United States (which would make his presidency illegitimate) and that he is a Muslim. 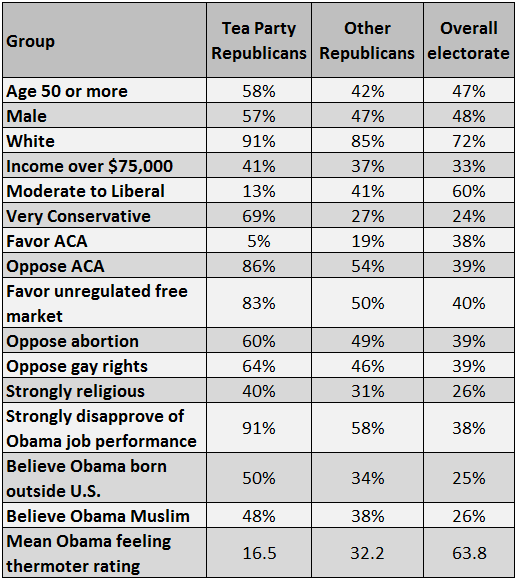 What makes the Tea Party so challenging for the Republican Party today is not just that Tea Party supporters have opinions that are well to the right of the overall electorate, but that they now comprise the most politically active segment of the GOP electoral base, as the data in Table 2 make clear. Tea Party supporters made up just over half of all Republican identifiers and independents leaning toward the Republican Party. But they comprised 57% of GOP voters, 64% of GOP primary voters and 66% of GOP opinion leaders — Republicans who tried to persuade a friend, relative or co-worker to vote for the GOP. Tea Party supporters made up the vast majority of Republicans who gave money to the party or its candidates, attended rallies or worked on a campaign. In fact, over half of Republicans attending rallies and over 60% of those working on campaigns were strong Tea Party supporters. These results indicate why it will be very difficult for mainstream Republican leaders and business groups to successfully challenge Tea Party incumbents and why such efforts could even backfire on the party establishment. Tea Party supporters now dominate the activist base of the Republican Party. In 2012 they made up nearly two-thirds of those who reported voting in Republican presidential primaries, and in 2014 they may well make up an even larger majority of those voting in what are likely to be very low turnout congressional primaries. Some might argue that the recent special election GOP primary in Alabama’s 1st Congressional District might augur well for the Republican establishment as the establishment-backed candidate defeated the Tea Party-backed one. However, it was a narrow five-point win that saw overwhelming resources put at the establishment candidate’s disposal. If anything, the ANES survey data suggest that a more realistic scenario in next year’s primaries is that more establishment Republican incumbents will be unseated by Tea Party challengers.